Every year, high school science students from around the country compete in WEF’s Stockholm Junior Water Prize, which aims to increase students’ interest in water-related issues and research and to raise awareness about global water challenges. The winners from around the country go on to compete in the national competition, which this year is June 16-17 at the University of North Carolina at Charlotte. Students create projects aimed at improving of water quality, water resources management, water protection, and drinking water and wastewater treatment. PNCWA is thrilled to announce the regional winners: Bryan To (Oregon), Apoorv Khandelwal (Washington) and Ari Carter (Idaho). Read more on our prize winners and their projects here. 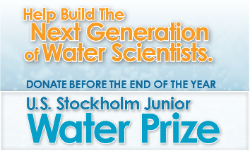 The Stockholm Junior Water Prize empowers high school students to identify and research ways to solve water challenges in our communities today and into the future. This international awards program recognizes the best and brightest students working to solve water problems in new and innovative ways. The SJWP was modeled after the international Stockholm Water Prize for which recognizes outstanding research on water issues. Each year, students are selected from competitions around the globe to travel to Stockholm, Sweden to present their research before a panel of international water experts. The winner receives $15,000 and a crystal award, and their school receives $5,000 for STEM education. Mentor students in your community. Check with your local high school science teachers to make sure they know about the competition. Offer to be a classroom speaker, talk about water issues in your community, and offer technical assistance to students interested in exploring water research. Judge local and regional science fairs. Judge state research papers submitted for the SJWP award. Each year, a panel of local experts helps select the winning research papers for Oregon, Washington, and Idaho. For more information or to VOLUNTEER to judge research papers, contact Catherine Chertudi, SJWP Coordinator for PNCWA: ► [email protected] or by phone: 208.384.3912.